Advertisements are a fantastic way to earn money from, especially in a well managed directory. JV-LD provides you with excellent advertisement features that lets you add ad spots, define what kind of ads can be placed in those ad spots, fix a one time or a recurring price for placing ads in the ad spots and also lets you track that income and even expire ads, as time progresses. 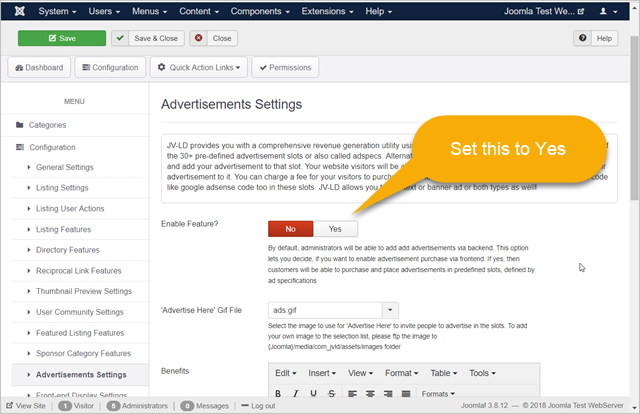 By default, administrators will be able to add add advertisements via back-end. There are options that lets you decide, if you want to enable advertisement purchase via front-end. If yes, then customers will be able to purchase and place advertisements in predefined slots, defined by ad specifications. Set 'Enable Feature' to Yes. In 'Benefits' field, you can add your own text that describes offering specifics or highlights of advertising in this directory in this field. This will be shown to the visitor in front-end, when they choose to advertise.